My mother has always told me, “don’t put junk in your body.” I always thought muscle-building supplements fell into that category, which is probably accurate to say. 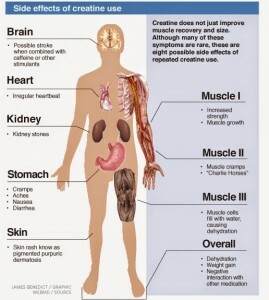 Nevertheless, creatine may be the outlier. A few weeks ago, I was shocked to find out how many of my friends took creatine. I thought, like the majority of other muscle-building supplements, that creatine would make people appear stronger than they actually are, but would damage the body over time. After researching the matter, I was surprised to find that creatine is a little more complex than I originally anticipated. Before I explore the pros and cons regarding creatine, it is important to understand its history, how it has developed over time, and why it has become so popular as of late. Chevreul, a french scientist, recognized an undiscovered component of skeletal muscle in 1835, and decided to call it creatine. Scientists first noticed that creatine is necessary for muscle activity when they learned that wild animals contain about ten times more creatine than domesticated animals do. According to the Mayo Clinic, oral consumption of creatine supplements became popular in the 1990s as people wished to be stronger, look stronger, and gain an advantage in athletics. To this day, creatine is still very popular in the US due to how effortless it is to take and its multiple benefits. According to Iron Man Magazine, creatine is the number one sports supplement. This, in part, is due to studies showing that 80 percent of people using creatine have found it effective. Moreover, according to Health Research Funding, creatine decreases the time needed to regenerate ATP, which gives muscles energy. As a result, creatine is expected to improve performance for brief, but intense workouts by 5 to 10 percent. According to Mark A. Jenkins, several double-blind, placebo experiments have been conducted, where half of the participants were given about 20 grams of creatine each day for 5 to 6 days, while the other half were given placebos. After these 5 or 6 days, each study made the participants do a certain exercise for a short period of time. The studies all concluded that the group of people taking creatine performed better than the group that took the placebo. Surprisingly, creatine might make the heart stronger and healthier. According to Penn State Hershey Medical Center, a few studies were conducted of people with heart failure. Similar to the other studies, this one divided the participants into two groups, half taking creatine and half taking a placebo, while both groups received standard medical care. The results of the studies showed that, in general, those who took creatine could do more exercise before becoming fatigued than those who took the placebo. On top of all these benefits, creatine is also cheap and easy to use, making it the most popular sports supplement in America today. Like any supplement that people put in their bodies, there will always be side effects, but is taking creatine worth these possible consequences? As supplemental creatine has only been popular for a few decades, there are not many studies on how it can harm the body. Obviously, too much creatine can be unsafe. 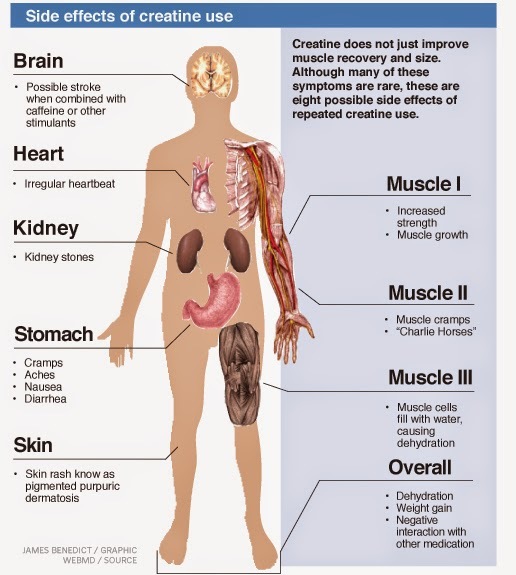 According to MedlinePlus, some research indicates that creatine could also damage the liver, kidney, and the heart. Still, not enough studies have been completed in order to show a significant correlation between taking creatine and these side effects. According to WebMD, other outcomes such as irregular heartbeats and skin conditions are possible effects of creatine, but, yet again, there is not enough research to see if there is a relationship between them. However, studies have shown that five to seven percent of people who take creatine will get either diarrhea, stomach aches, or both, according to Men’s Health. 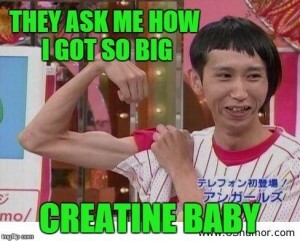 Additionally, creatine does not work as well for meat and fish eaters because these people already have high levels of creatine in their muscles. Some studies have indicated that creatine could cause kidney problems for people with high blood pressure or diabetes, for those on anti-inflammatory drugs such as ibuprofen, or for people over the age of 40. Despite this evidence, unsurprisingly, there have not been enough large-scale studies conducted in order to see a distinct correlation between creatine and these side effects. All in all, making a decision on whether creatine is bad for people or not, at this moment, would be unjust. There are simply not enough large-scale studies out there to figure out if there are correlations between creatine supplements and the long list of possible side effects. From my own research, the only study where a negative conclusion could be clearly stated claimed that five to seven percent of people will either get stomach aches, diarrhea, or both if they take creatine. Nevertheless, five to seven percent is not a very high chance. Furthermore, these side effects are not terrible consequences and are only short-term problems. The file drawer problem could also play a part in this lack of information on the side effects of creatine. Body building companies have performed studies on the effects of creatine, yet a majority of the body building websites claim that the side effects are, to the most part, all myths. It is hard to believe that websites like webMD, Men’sHealth, and MedlinePlus have all concluded that there is not enough information on the side effects of creatine supplements, yet body building websites have done enough large-scale studies to conclude that these side effects are all misconceptions. I find it more likely that body building websites are only publishing studies with positive results, while hiding studies that show a correlation between supplemental creatine use and certain side effects. Hence, the file drawer problem could exist in this case. Therefore, in my opinion, I believe there is not enough evidence to say whether creatine is bad for people, in the short-term and especially in the long-term. Personally, I don’t see the advantage in taking creatine supplements until more studies are conducted on the matter as people could be in risk of serious side effects. This entry was posted in Uncategorized on October 19, 2016 by Anthony Michael Calligaro. This is a really interesting topic. Actually, many of my friends focus on muscle building too. But none of them takes Creatine because of its side effect. Instead, they went to the gym to exercise and controling their diet by eating more egg whites or fishes that contain protein. Here is the video link about the risk of taking Creatine if you want to learn more https://www.youtube.com/watch?v=jrme3nNAXG0. Anthony, I often wondered the same thing during my junior hockey playing days. I had a lot of teammates who would use it on and off. I tried it during the summer after my one season ended. I definitely bulked up. Although, a little after I stopped taking creatine, I slimmed back down. I feel that I was carrying a lot of water weight while I was using it. I I only noticed positive side effects when it came to my summer training program. I didn’t notice any unusual or concerning side effects. There are many different reviews out there for you to check out. 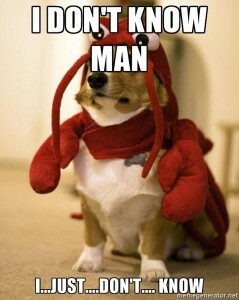 Here is one that I found. This article intrigued me because I started taking Creatine about a year ago. What I noticed was that my ability to exercise improved and I saw myself gaining muscle faster than before. As far as I could tell there were no side effects. What is interesting is that I was given a schedule which suggested that I don’t consume creatine on a regular basis. Instead I followed a consumption method know as creatine loading (http://www.bodybuilding.com/fun/anssi1.htm) where different amounts of creatine are consumed every week depending on a persons weight, height etc. I couldn’t find why this method worked more effectively than others, but I thought it would be an interesting discussion point for this paper. My best guess is that the body has to be gradually introduced to the new levels of creatine, instead of taking it all at once. My ex-roommate from last semester also told me about how he performed much better with creatine, which made me consider buying it. After reading your post, I wanted to ask if you think that there could still be many confounding variables, which could lead to some people to be more prone to the side effects you mentioned. Maybe it is very individualized and works like allergy? I actually did find an article talking about allergies to creatine, you should check it out if you are interested !